This weekend is the Improv Wins Conference and Festival in Austin. From this Thursday through Sunday (Jan. 22-25), improvisers from around the world converge on The New Movement Theater to take workshops, perform a ton, and network with their peers. AustinImprov.com interviewed Amy Jordan, the director of education for The New Movement (TNM) and one of the main organizers of Improv Wins. 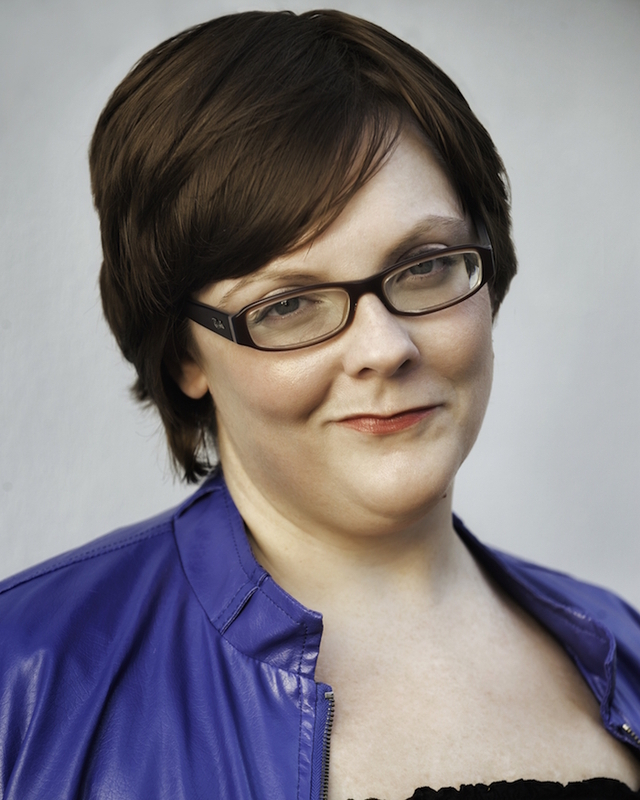 She’s got plenty of great insights into TNM’s unique improv philosophy and this one-of-a-kind improv event. For more info on Improv Wins—and to buy tickets or sign up for their many wonderful workshops—visit improvwins.com. Hi, Amy! Many improvisers think there are basically two schools of improv—the Del Close style and the Keith Johnstone style. One emphasizes finding the funny thing and exploring it, while the other emphasizes being very present and telling a story. I get the impression that TNM offers a third, different approach. True? How would you most succinctly describe how TNM’s improv philosophy is different from traditional approaches? I feel like TNM combines both philosophies in a way. The idea of “living in the moment” is a big part of our style. And we certainly do not shy away from game. I just don’t think either one of those things are the driving force behind our efforts. TNM believes that everything you need in a scene is right there in front of you. You can see the world beginning to bloom when you first lay eyes on your scene partner. In the first few moments of every scene, the improvisers are slowly, carefully building a world together. We use the word “STUMBLE” to indicate this idea of discovering what is already happening between you and your scene partner, rather than inventing a story. With each move an improviser makes, he/she is finding out more about the world they’re in and every movement and every phrase they use adds to the whole picture. And because this process of finding the moment is so delicate, we really push the idea of being kind to each other and creating a safe space. We think that’s the best way to inspire the truest form of creativity. I’ve seen a number of TNM shows, and I don’t believe any of them ever started with the improvisers taking a suggestion from the audience. How does not taking suggestions fit into the TNM approach? We don’t take suggestions, which is different from a lot of improv schools, yes. We believe in training the improv brain to build from nothing. Plus, we think suggestions can limit what options you have to build your scene. We trust our students to come up with ideas on their own without a suggestion and with practice, this gets easier and easier. If we provide a suggestion, it’s like we are giving our students a safety net and they don’t need one. A philosophy inherent to every level of improv at TNM is UBH – Ultimate Back Having. This means that when you are in a scene, your job is to take care of your scene partner. During classes, we build trust between students and with that bond, they are able to be each other’s safety net during each scene. How did you personally get involved in improv? Where did you study? I performed some improv in college but it was mostly short form. My way into TNM was through stand-up. I had been a stand-up comic in NYC for a few years and I took a vacation to Austin one year to visit friends and happened to go to a comedy show that featured Chris Trew. He and I became friends on Facebook and as soon as I moved to town, I started learning long form improv under the tutelage of Chris & Tami. Since then, I have had great opportunities to take workshops from great improvisers like Joe Bill and Matt Donnelly and Tim Paul and I have to say, it was exactly the artform I was looking for. I like the team effort of improv so much better than stand-up. And I just love teaching so completely. It warms my heart every time I get to do it! 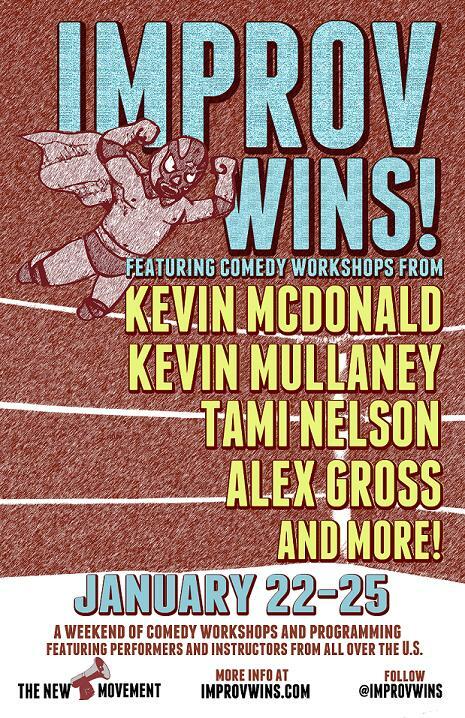 Improv Wins is the name of your conference (Jan. 22-25, Austin) as well as the name of the improv book written by TNM founders Chris Trew and Tami Nelson. What does “Improv Wins” mean? I can tell you what “Improv Wins” means to me: I think of the phrase like when people say they are winning at life. To me, “Improv Wins” is about how improv makes your life better every time you participate in it. Every time you put yourself out there and try to do some improv, you are winning. That’s how I use it. But I think it’s open-ended. It can be, for you, what you need it to be, just like improv. Also, just thinking about it now because you asked, part of me feels like “Improv Wins” is about trying to make the art form more palatable to a larger audience. I mean, how many times have you heard comedy people make fun of improv? Well, if we show them how amazing improv is and how formative it can be to a creative community well then “improv wins,” you know? Improv Wins is an educational conference as well as a festival of shows. There will be shows featuring our visiting talent on Friday, Saturday and Sunday of this weekend and that’s amazing, but for me, the best part is the workshops. I am TNM Austin’s Conservatory Director so for me, education is the most important! We have workshops all day on Friday, Saturday and Sunday this weekend. We have Kevin McDonald (Kids In the Hall) to teach his improv-to-sketch workshop on Friday, and then the attendees showcase their work that night at 7:30 p.m.—with Kevin McDonald acting with them! On Saturday and Sunday, we have workshops all day – we have some really great teachers in this year! We have a four-hour master classes with Kevin Mullaney of Under the Gun theater in Chicago and Alex Gross from Philly Improv Theater. Plus, there will be a master class on rocking a weekly sketch comedy show, a master class on comedy video production, and many more workshops taught by visiting improvisers from Pittsburgh and Houston—as well as TNM Austin and TNM New Orleans faculty members. We have workshops on improv, on sketch, and even a lunchtime lecture on Saturday at 1:00 p.m. about how to break into the TV business. For the full line-up, visit the website. Why should an improviser attend Improv Wins? Can non-TNM improvisers attend? Anyone and everyone should attend Improv Wins! It is a wonderful experience doing a full weekend of improv workshops. So many breakthroughs. So many moments of clarity. It is a true joy to watch and experience us all geek out over this art form that we love. And I love all the discussions we have, exploring the comedy world and working to make ourselves better performers within it. There are workshops available for beginners as well as experienced performers. Please spread the word to everyone you know. This is a really affordable chance to get better onstage and to meet the other hungry performers in this town. TNM offers plenty of stage time to TNM students. What responsibility does an improv school/theater have to create opportunities for its students? We are all about giving students the power. Our students invest in TNM by spending their time and money taking our classes and in turn, a large chunk of our weekly programming is dedicated to providing stage time to them. All of our students are free to form troupes and pitch shows; they can play in TNM’s weekly student improv jam, Student Union (or in our monthly sketch open mic, The Lab); and, we give all of our Austin performers a chance to perform at our theater in New Orleans as well. I think the responsibility of a theater is to empower their students to create their own projects. This is all about creativity, after all. So I want my students to find what makes them happy. So we give them opportunities to try stuff out and then every couple months, we have a town hall meeting where hungry performers can come and develop their new ideas and pitch new show ideas. At TNM, you can be as active as you want. You get out of the theater what you put into it. What do you most love about improv? I love that the more open you are—to the process, to your partner, to your own creative ideas—the better you are as an improviser. It’s very different from the harsh realities of the real world to have kindness and support be the anchors, but they are. In such a kind environment, people are free to be who they are without judgment. That’s the kind of world I want to live in, so that’s what I bring to improv. What’s the hardest you’ve ever laughed? Gosh, I don’t know. I laugh often. I really enjoy the people around me when I am teaching them or coaching them or performing alongside them. I am lucky enough to have seen really amazing performances in my tenure at TNM and in my years as a stand-up in NYC in the early 2000s. One of my most recent faves was an ad lib at the end of a sketch scene. There was a scene that had all the holidays as characters, and they all wanted to hang out with Christmas instead of Thanksgiving. At the end of the scene, all of the partygoers have left and Thanksgiving is all alone. I played “All By Myself” to punctuate the moment, and as I brought the lights down, the guy playing Thanksgiving got up and did an improvised speech about how it was hard to be the one holiday that no one cares about. It was amazing and hysterically funny. We added it to the show right then and there.